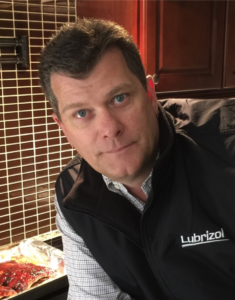 Employee Spotlight: Paul Winstead | Lubrizol Advanced Materials, Inc.
Over the past five years, Paul Winstead, southeast territory manager, has used his passion and thirty years of experience to make products using Lubrizol’s CPVC the best in the piping industry. Long before working as a Lubrizol employee, Winstead realized his passion for getting his hands dirty. He started off in the fire protection industry in 1988, where he worked for his brother-in-law at the age of 16. For the first six months, he learned to cut and thread pipe before moving onto the engineering department. During that assignment, he learned he needed to be well-versed in electric, plumbing and mechanical applications to be a successful engineer. To add to his already impressive engineering resume, Winstead became the first in the area to learn the CAD program, which he trained and taught coworkers and other industry professionals to use. During his time in the fire protection industry, Winstead held the roles of design manager, branch manager, district general manager and even started his own company. This diversified experience led to his career with Lubrizol, for which he is very thankful. “I think back to a younger employee I had the opportunity to train,” said Winstead. “He shared all he was learning at Lubrizol, and mentioned that he felt the work we were doing was ‘to protect property and lives’ above all." "I corrected him and said he had it just a little wrong. It is important work we’re doing but he had it flipped – our mission is ‘to protect lives and property’. We put customers' lives first, always." When asked about his biggest accomplishment during his five years with Lubrizol, he said his greatest impact has been getting companies to convert from steel and copper to CPVC. Overall, Winstead has always believed it is essential to develop a relationship with customers and to gain their trust through honesty and transparency. Above all, Winstead believes in FlowGuard Gold, Corzan and Blazemaster CPVC products, and says knowing that Lubrizol invented CPVC and invested significant time on research and development ensures him he is working with the best. When Winstead isn’t working, he enjoys working around the house mowing the lawn, trimming the hedges and grilling - especially experimenting with smoking different meats. He has a world class barbeque sauce recipe, so be sure to ask him when you see him. When the weather isn’t so nice, you can usually find Winstead playing Xbox or watching football.